DAYTONA BEACH, Florida - It could be several months, or even years, before the public records battle between the Economic Development Commission of Florida's Space Coast (EDC) and Brevard County Clerk of Court, Scott Ellis, is resolved. That's because Florida's 5th District Court of Appeal has returned the case for another fact-finding trial to the lower court in Brevard County, Florida with instructions to apply a different legal analysis to the case. Following a 1999 case, Mem'l Hosp.-W. Volusia Inc., the 5th DCA held that " ... Application of the Schwabfactors test involves mixed questions of law and fact. Here, there was a two-day evidentiary hearing during which several witnesses testified. On appeal, each party has emphasized different testimony from which competing conclusions might be reached concerning the Schwab factors. The trial court who was present during the two-day hearing is in the best position to evaluate the witnesses, their testimony, and any other evidence. Accordingly, we remand the case to the trial court for further analysis utilizing the Schwab totality of factors test and further proceedings consistent with this decision." Regardless of the outcome of the second trial, the appellate court made it clear that the EDC would not be liable for attorney's fees. "We affirm the trial court’s decision to deny Ellis’ motion for attorney’s fees, because attorney’s fees should not be awarded in those cases where the party refusing to provide documents acted on the good-faith belief that it was not an agent, subject to compliance with the Act," the 5th DCA held, citing Stanfield v. Salvation Army. "The hard fact as we presented was if you want a tax abatement, cash incentive, or any form of incentive you MUST go the EDC, Ellis wrote in an email to Brevard Times. "The EDC case was misleading claiming other entities do the nebulous ‘economic development’ and calling anything and everything economic development." "The Chambers of Commerce and nobody else does what the EDC does and is given a monopoly power to do – process applications for tax abatement and incentives. Whatever NBEDZ does now was not done then in 2012." "The EDC has the full delegation of the County Commission to process the applications. There are no county employees paid to do initial processing." "If we go the route of the re-hearing we will present more evidence of the sole delegation." 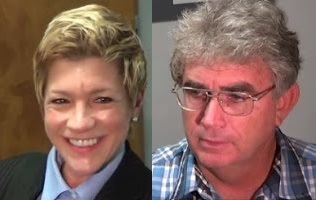 BlueWare is the company caught up in a public corruption criminal case brought by the Florida Department of Law Enforcement and State Attorney Phil Archer against former Clerk of Court, Mitch Needelman, his former business partner Matt Dupree, and BlueWare CEO Rose Harr.